Last week, Aseem Malhotra addressed the European Parliament to talk about the complete nonsense of the current dietary guidelines. Also, the power of the Nutritional and pharmaceutical industries to distort those guidelines and drive the use of more and more medications. I recommend that everyone has a look. Thank you. I think this is important to view and share. This entry was posted in Diet & Health, NHS on April 15, 2018 by Dr. Malcolm Kendrick. I think he’s right…but I also think we got to this point because of nanny-statists, do-gooders like he appears to be. For instance, he’s a big supporter of sugar tax, which can have many unintended consequences – we don’t know how dangerous an increase in consumption of artificial sweeteners (due to reformulation and switching to diet versions of fizzy drinks) will turn out to be. We also don’t know how much people will compensate (I drink a reduced sugar beverage, so I ‘deserve’ an extra cookie mentality). Also at 43:52 in the video he talks about ‘Helena miracle’ —reduction of 40% in heart attack hospital admissions following a public smoking ban in that town. That he uncritically repeats this type of junk science is mind boggling…and it’s the reason why we’ve been scared off eggs and meat and butter. Because of nice looking, convincingly talking guys like him in the 1960-70s. Vlad. Aseem is one of the good guys. I don’t agree with everything he says or does (I am never a great fan of banning and taxing and suchlike), but his intentions are good and his desire to practice better medicine is great. Yes, he is a bit too focused on diet for my liking, but currently these are niggles. I found that very interesting but wonder what my GP and diabetic nurse would say ? Re Vlad’s interesting comments about “nanny-statist do-gooders”, I’ve now learned a new term…nanny-statist, which I had not heard of before this. And, hopefully we actually want do-gooders, as opposed to do-badders! That is an intriguing comment about a sugar tax and possible increase in artificial sweeteners. It would be good to learn more about the Helena study. Does the fact that Dr. Malhotra IS kinda hot (“nice looking”) make him unreliable? Surely that should not be a factor in who we should listen to! Come to think of it, Dr. K. is nice to look at too…. uh oh…. I’m suspicious of panaceas; I’m particularly suspicious of panaceas that involve nutrition, where so much that is purportedly known is (as far as I can tell) junk. I really don’t think we need a second version of diet puritanism telling us that we’re in for hellfire if we eat the wrong stuff. Yes, but I would rather have a panacea that is more right than wrong, rather than more wrong than right. Dearie, I know what you mean, but I don’t think we’ll ever discover that sugar is good for us. This is a subject where we’re on safe ground, unlike the condemnation of fat. Hi Stephen T it really depends on one’s definition of sugar and what ‘good for you’ means. I would argue that there are some parallels between the demonisation of saturated fat/cholesterol and the current sugar-phobic views. Glucose, just like cholesterol, is vital for our survival and if we don’t eat it our body produces it. So to that extent glucose is good for you. so, Vlad, you see Aseem as a ‘do-gooder’, presumably in a derogatory manner. Well, I consider Aseem is doing his very best to improve our lot is life, and I see your negative comments as just trying to knock him off his well-earned perch. Anti-sugar bloggers rarely suggest substituting with artificial sweeteners as we know it just puts off the day when we need to re-educate our sweet tooth, and also because they detrimentally interfere with the gut-biome. You must think we are easily swayed by ‘looks’, when in fact most of us on this blog enjoy good science, and are not so small minded as to get the two confused. Looks like my blood glucose may have been on the low side when I responded to Vlad; I stand by my remarks, but perhaps I ought to have been a bit gentler on how I expressed myself. I am usually pretty much against taxing and banning and suchlike. I think the Netherlands have introduced a tax on fatty foods. Probably thinking they are doing a good thing. It is easy to force people to submit to your will, it is far harder to convince them. Unless you can convince them, you will never succeed in the long run. I came here specifically to notify of this (Ivor’s link) – after finding the link from Malcolm has an edit on the statin issue- as also noted by a commenter in that video comment section. What’s news to those who ‘know it all already’? (comments below). Surely the fact that this movement is growing a public voice and declaring more openly what has often been assigned to ‘voices in the wilderness’ is significant as a participance – rather than a private ‘fact’ gatherer? The open recognition that human beings are pharmed into sickness (and war) for profit under all sorts of wishful thinking or outright deceit, is part of the way to challenging what we run on as ‘accepted thinking’ and therefore waking from a gross negligence of abnegated responsibility as a result of our own wishful thinking or outright deceit. (Nothing new though – ie HG Wells – Time Machine). The first awakening is to deeply disturbing sickness of a loss of a world that is revealed NOT as we presumed. Denial fails an rage and powerlessness then come up in moral outrage and blame – who then suffers? Perhaps fear (of powerlessness) and rage (hurt into hate) can instead provide the life-energy by which to channel a deeper honesty under a re-educative imperative? That is to say use it, rather than being used by it. Perhaps this addresses the very nub of a lot of sickness; as the result of being run by false thinking and the resultant emotional conflicts and physical drain that then manifest in every kind of relational and vital blocking obstruction, inflammation and conditioned reflex, and breakdown or loss of function. On the one hand we ARE responsible for what we think – for what we do automatically proceeds from our perception, and yet no one is overly punished for killing a patient under the official ‘standard of care’. Most of us have very significant investment in our ‘reality’ and seek to salvage it by ‘damage control’ so as to resume business as usual asap. If forced to the predator class will make token sacrifice while regrouping under other subversions of ‘rising movements’ that they can use to mask in. They work through the willingness of others to work for them rather than suffer real or imagined penalty – which is to say – if you want to get on you have to learn and follow the rules that are inducted behaviourally and rarely openly spoken. (Such as Dr Suzanne Humphries discovered as a result of dutifully reporting vaccine injuries and persisting under a sense of integrity with regard to her job and her patients – and so she lost her job and they lost her). This two faced do as I say not as I do – is coming up a lot as fake news or narrative control. Accusing one’s active sins in the ‘other’ as a last ditch evasion without substance. The post-truth way to make the facts fit the agenda and then assert it’s legal because ‘we say so’. True grass roots movement is the condition in which people in all sorts of levels of witness and responsibility will consider taking action that may otherwise seem too fearful and ill-timed. I also sense that war is historically used to shift everything and reset the narrative rather than lose power. And I don’t see the demeanour of power in the crisis actors who are supposed to be ‘running’ this or most other countries. Give unto narrative control what is due unto narrative control – but not what is due unto true. Personally I see the whole thing is bankrupt and true foundation is called for – which is self-honesty rather than defended self-image. But until the idols fall, it is invisibly passing off as if a self-evident reality. The EU Parliament has no power to make or edit law by the way. That was one reason why I felt there might be more accountability via a national government – but ‘trade deals’ and other such devices effectively transfer power to technocrats and lawyers – or rather – to who can afford them. I appreciate your “deep” philosophical thoughts here and agree with most of what you claim! Still I realize that similar types of “moral concerns” follows history and you easily find it in the bible or for that matter penetrating most of the works of Plato. My old (80 +) diabetic friend payed me a visit yesterday and the sad fact is that he is now on a polypharma regimen and that I am not allowed to discuss his medication or diet by his two well-intentioned daughters one of which is a nurse and the other a vegetarian of moral inclinations. Statins is for sure a taboo subject! I still asked him about his blood glucose control (which he earlier kept in good control through LCHF) but which recently went out of control and which prompted more medications. He has an old blood glucose meter which doesn’t seem to work anymore so he had asked his diabetic nurse to recommend a new one. She had responded that he didn’t need one anymore since he was so well medicated. So we measured his glucose level with my own meter and his level was now about 10 (he mentioned that it had been over 20 earlier) . We also used my ketone meter and found that he was also well in the ketogenic state although he stated that he now was cheating a lot with carbs encouraged by his well intentioned surrounding. This alarmed me since this first of all talks about a turn from T2D to T1D where these two conditions (high glucose and a ketogenic state) taken together indicate a Diabetic ketoacidosis state which could for sure be life threatening. Well, I am not allowed to interfere and I didn’t. Still his mind is very clear and sharp as it has always been but I fear the worst through a metabolic breakdown soon but can do nothing about it. Hi Malcolm, thanks for helping share this highly important link to the European Parliament Event. Also thanks Ivor for recording the event! I’m glad that I was able to attend in person. Agree also Aseem is one of the good guys and its important we support him. Watching this video has been the best use of a Sunday afternoon. Thankyou Dr Kendrick. I declined and just had a cuppa. Hi Malcolm, I know this lengthy talk is well intentioned. I know all the speakers are on the side of the angels. However after about 20 minutes or so my mind was wandering..I started to think what is there here which is new to me; that i have not heard before; that I need to hear & understand. And I’m afraid that the answer came loud in my mind “very little”. But more importantly it is not an easy view. It is 1 hr & 44 minutes long.. And it really tried my capacity to stay with the speakers, pay attention, and appreciate what they were staying.. And finally I gave up and stopped the video…. It was a long video, Bill in Oz, and a lot of what was being shared was, of course, that which those of us who’ve been following the subject for a while already know. The point is that I’m sure those members of the European Parliament who were there at the conference don’t know this stuff, and it is important for legislators to be aware that the reasons behind such epidemics as obesity and T2 diabetes, to give two examples, are mainly due to misinformation driven by those who stand to benefit such as those producing refined carb, processed foods and the pharmaceutical companies (and those associated with them). Obviously Nathan Gill has benefited from going against the conventional medical advice, as did those in the case studies presented by the speakers. As for medical interventions, it seems crazy to me that so many interventions that are not effective or are even harmful are being recommended by NICE and are wasting millions of pounds and that there is an obvious conflict of interest and bias going on due to many of the guideline authors having strong links with Big Pharma. Malhotra said it’s important to listen to the patient – yet the NHS is stopping funding for Homeopathy at the Royal London Hospital for Integrated Medicine (formerly the Royal Homeopathic Hospital) which is something like 0.4% of the NHS drugs bill and the patients themselves say the benefits of that treatment are far, far better than what conventional medicine did for them – but the NHS is still funding these other, conventional interventions that are a waste of money and useless! Every time you hear or read ‘waste of money’ note that there is another side to the balance sheet. And useless or futile ‘wars’ on ‘whatever’ are THE WAY to set budget allocations and let people ‘follow the money’ without realising that they are following and supporting the agenda of people with money who use it to leverage undue and generally hidden influence. True, for those of us who are keen students of the subject, we had heard it all before and it was rather like hearing his book read out very, very fast. But, the important thing was that he was actually saying it, where he was saying it and who was sat there, our of camera shot, listening, not to mention the many people who will hear it and take it seriously because it is being said in front of an EU committee. Just watch it in chunks Bill. Seriously though this is everything I have known in my gut but haven’t been able to articulate. Thank you so much. Have been passing on the link to as many people as possible. I do wish they’d had Zoë Harcombe on there to speak about nutrition…and as for Dr Richard Thompson’s assertion that supplements are a waste of time, that rather overall dismissal isn’t helpful. Certain supplements definitely do help many people and are likely to be necessary in order to compensate for people’s poor diets, being as it was quoted in the video that about 40% (I think it was?) of most people’s daily diet comprises processed foods. I know many people who have benefited from taking certain supplements such as magnesium, vitamin D and fish oil when their own GPs were at a loss as to how to help them. There are ‘safe’ targets in certain social groupings that are often called on to present that you are ‘on side’. The same are denigrated as the foil to something ‘superior’ to which the appeal is to identify in. If supplements that supply a need are largely preventative in supporting health, then they are not drug interventions for the suppression of symptoms. I am inspired by Dr Peter Goztche’s willingness to call out criminal pharma – but he starts his book with disinfo on vitamins. While she went over the line – and knew it – The Medical Mafia: How to Get Out of it Alive and Take Back Our Health and Wealth (by Guylaine Lanctot) is not wrong! – but she didn’t stay in the ‘medical’ paradigm to write it. I read Dr. Lanctot’s book years ago, and it got me started on the “questioning” path. I seem to remember that she was persecuted for writing the book. Bill in Oz, thanks for the link to the interesting article (neat site, too) on type 2 diabetes and Chamomile. I’ll try to convince my husband to try it (he’s a black tea kinda guy)! Possible explanation for positive effect of chamomile could be that it interacts with the endocannabinoid system. Thank you – I was also upset by the blanket negative comments about supplements, whether vitamin, enzyme or mineral. Given that the nutritional value of plants today is substantially lower than those grown 50 years ago, it would appear to be an ignorant stance to take. Dr Kendrick, and many others have cited the research on the importance of certain supplements for cardiac health. I know, there were things in the video that I was not on board with. However, it is an attempt to move things in a better direction. Yes, can only agree re: modern farmed veggies etc are less ‘nutritious’ than they were, say 100 years ago. I came across a chart showing the differences ‘now’ compared to around 1900. Very sobering indeed. Then there are the local environmental conditions, such as my end of the country which has long been known as seriously selenium deficient. I have no problem obtaining it in a capsule ! Frederica, I’ll happily support someone in the medical world when I agree with ninety per cent of what they say. Alliances aren’t made up of people who all agree 100%. Let’s unite on the main thrust and not worry about minor differences. Please don’t think that I don’t fully support the doctors on the panel and their message! I was simply agreeing with a comment that had been made with regard to supplements. Yes, I was a bit disappointed with the blanket condemnation of supplements, but that could have been me a few years ago. I also noted this.And I think it was Queen Elizabeth’s personal GP who was strong on this issue.I disagree completely with his view.In my experience some supplements are very useful and beneficial. Like Vitamin C, Vitamin K2, Vitamin D3, Lithium Orotate, DHEA, Cq10, B3, Chondroitin sulfate, Potassium, Magnesium,, fish oil etc. However too much Vitamin E can be problematic. Among it’s side effects are delayed wound healing and bleeding. And this happened to me shortly after I started taking 2 by 5000 IU capsules of Vitamin E. I stopped and now the bleeding has stopped. Goran, you have mentioned Vitamin E a number of times.Have you met this issue ? This site looks pretty well informed unlike many that popped up in my searches. It is true that the vitamin E issue is a tricky one since there are eight different kinds and in the natural form they exist in a certain proportion. The synthetic version of vitamin E does not contain all these kinds. When you read papers about the “dangers” with vitamin E (all sponsored by big Pharma?) you can be pretty sure that they have used the synthetic type. I did this before embarking on the vitamin E “bandwagon” for my angina – which seems to work pretty well at 2400 iu/day of natural vitamin E, the natural D-alpha form, as it occurs in food..
What I have read, 5000 iu sound rather “brutal” especially if it is of the synthetic variant. I have also read that if you have really serious CVD problems you have to be careful since you can stress/strengthen your ailing heart in a dangerous way to work harder and you should therefor ramp up slowly until your angina problems are gone and that is actually what I have done myself and arriving at 2400 iu today (about 100 times the recommended value). What the Shute institute in Canada learnt about this, treating 50 000 CVD patients before being forced to close down, is basically swept under the carpet but can be dug out if one is interested enough. Thanks Goran for your reply and comments about vitamin E. I admit to being fairly uninformed about it months ago when I first started taking it. And I nievely thought more is better. But such is the path to gain knowledge sometimes.. I will check out the links you suggested ! But it’s not about you, Bill. Link it to someone you know who’s still breakfasting dutifully on granola and skim milk. Thanks for the link. I will say the thanks more wholeheartedly when our pathetic”brodband” lets me watch it comfortably. Makes me laugh when they talk of practising medicine over the internet. I would do better with a fleet-footed laddie with a piece of paper! Heart felt thanks Dr KendrIck for bringing this video to our attention and for for all the other information you pass on to us, for which we are extremely grateful. Thank you, I’ll watch and pass it on! I will as well. Thank you, Dr, for this link. It is good to know what is happening although I guess, as has been pointed out, this video is not intended for us already “converted”, who have been studying this issue for many years, but for politicians to “wake up”. But could it be as is evident in this specific case that they first have to be hit by the “syndrome” personally and to do the successful low carb experiment on themselves before they think that it could be worth a piece (a large one?) of their own political carrier to challenge “the system” and take firm aktion. Wow! I was screaming at this video “YES,YES!” Dr. K, this is also everything you have written about in your two books. 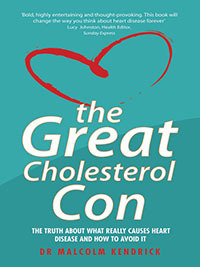 By the way, have you updated The Great Cholesterol Con yet? I have several more people I want to send this to. This message as GOT to get out to the public. I’ve already shared this to my friends on Facebook. Hopefully it will go viral and out front and center. Thanks for sending this. That squeaking noise you just heard is the sound of dieticians’ knickers getting into a twist. I was just reading some dieticians’ Twitter feeds decrying him for achieving results they cannot. It’s insane!! I so identified with the description of the food in hospitals. I’ve been twice for stents (another story in itself) and both hospitals had a Dunkin Donuts inside! First stay I was served french toast with margarine, fake syrup, orange juice, and low fat milk. The second time I was given a full sized coke, crackers and peanut butter. Yet – both times, could not get a black cup of coffee – after all “I was in the cardiac unit”.. ….. I told them that until the hospitals, doctors, etc practiced what they preached as well as to recognize the controversy, they were losing a lot of credibility. The sad fact is that with cut budgets, its far too easy for hospitals and schools etc to accept a kickback from soda companies to let them site a vending machine in their corridors.. Essentially they pay to rent a square metre of floor space in the notion that it offers a service to the public. Most stretched schools and hospitals will take their money. Thanks for the link. I just posted my own comments there. Interesting that the presentation was to the EU – it would suggest an open-mindedness that UK politicians haven’t shown towards such issues as thyroid provision and statin ‘guidelines’. Thanks for that wonderful video! Obviously this should result in immediate changes to the health care system, and a high powered review of all drugs to see how safe and useful they really are. Individuals found guilty of putting profits ahead of patient safety should get lengthy jail sentences…..
What will happen – roughly nothing at all! There was a point in the talk where Aseem Malhotra said that change must come from the top down. I am absolutely convinced it will not – either to fix the diabetes scandal, or the statin scandal! Nor will anything be done top down to fix the more general problems with modern science that he outlined. At another point Aseem Malhotra revealed the amazing fact (presumably not new, but new to me) that Rory Collins was involved with a company selling a kit to detect people’s vulnerability to statins, and their literature is claiming 29% (if memory serves me right) of people were at risk of side effects. That is clearly completely contradictory to his stated position regarding statin side effects – so how come he is still in post? I feel now that nothing will happen now, until so many people refuse standard treatments that the medical profession as a whole (maybe minus Rory Collins) rises up and demands change. A lot of the problem is that politicians can easily get very burned by such issues – if they took on the statin scandal, they would be condemned for meddling in something they know nothing about – killing people. I made an attempt to get the UKIP health spokesperson interested in this some time ago, but didn’t get a response. Maybe we are getting close to a revolt. A lot of people seem to be returning to butter, and I think some people don’t even realise that this is against official medical advice! I don’t imagine the chair of that meeting is alone in abandoning his diabetes advice and eating an HFLC diet to cure himself. Whenever The Mail runs an online medical science story, the comments are full of scorn, “But last week you said…..!” This reveals another aspect of the same debasement of science – supposedly scientific advice is pouring out, complete with obvious inconsistencies, and people shrug their shoulders! The authority of medicine is clearly starting to implode. I think nothing will change until doctors start to panic. There was a time when people would shrink from questioning their own or others’ medical advice – but my impression is that those days are over. We are a commodity. but, keep fighting folks. Good video, had my wife watch. In her mind only a doctor can be trusted to give medical advice, now she is confused. “The endocannabinoid system regulates vital functions such as appetite, sleep, motor control, memory, pain, mood, immune response and much more. Research shows that the ECS is intimately integrated with our perception of external and internal stimuli. In fact, the ECS even helps regulate responses in our body like anxiety or stress. The primary role of the endocannabinoid system is to maintain homeostasis or balance among all these processes. When the ECS becomes unbalanced, disease, illness, or stress can develop. A balanced endocannabinoid system supports a healthy stress response. I’m a big fan of Aseem, but I disagree with his assertion that the fee-for-service system in the US is driving the massive overuse of health services. It’s manifestly happening in the UK and Europe, where FFS is less prominent. The major culprit is the third party payment. With very little out-of-pocket downside, patients willingly go along with excessive treatment. Surely many people in the US have health insurance, so that just as here, they don’t have to think about the cost at the time they agree to a string of tests? Unfortunately, most US insurance is co-pay. Even though one is paying high premiums, one has to pay for services, often $4-5,000, before insurance kicks in. Also, there is often a battle royal with the insurance companies, as they are the arbiters, not the doctor, of whether a test, service, surgery, etc is allowed. In Oz we have a medicare system where the government pays a set fee for each type of service. Many doctors bulk bill to Medicare and the patients then pay nothing extra. When doctors do not bulk bill there can be substantial direct out of pocket expenses for patients unless they have additional private medical insurance. But I suggest that patients with a medical issue attend medical doctor consultations in the belief & hope of being cured..Hope is a very big incentive. I was particularly concerned to hear about the potential bias of some of the NICE committee. Can NICE really be trusted? I am often here NICE guidelines quoted at me by statin supporters!! Laura, NICE is heavily influenced by ‘experts’ who often have strong financial links to the pharmaceutical industry. The GPs committee on NICE voted unanimously against the wider use of statins and were over-ruled by a NICE committee two-thirds of whom had strong links, including financial, to pharma. So, we have to decide whether we believe GPs or a committee with a strong majority involved with drugs companies. Not a decision that took me long to make. I found this excellent electic video most educative and informative. Thanks to the distinguished panel for their logic and lucidity. I had my letter published in the February edition of the BMJ which Academic Journal thankfully takes an objective learned view on Self Autonomy in contrast to our majority conservative elderly medical profession. The medical profession needs to address not only its lack of dietary knowledge alluded to in this educational video but also their lack of knowledge of nutritional psychology and more important independence of thought and ideas which I dare to suggest in my letter, a good grounding in philosophy, and the philosophy of science may therapeutically address! I am “no longer a lone prophet crying in the wilderness” to use that biblical phrase -re my negative views of statins, the drug industry and the adverse effects on a healthy life style viz an appropriate. diet! My independent stance originated initially from my psychology/statistical research based studies at TCD and more recent my assessment of the statistics of the toxic effects of statins when the use of statins emerged in the early Eighties for which Dublin University, awarded rightly a Honorary Doctorate to the Danish physician concerned, who recorded with painstaking diligence, the toxic physiological effects on multiple cadavers for his pioneering breakthrough! The Danish scientist’s research is now conveniently forgotten !- for reasons which may be clear from this video. His research findings and Hononary Doctorate are no longer accessible in the TCD profiles of Honorary awards of distinguished recipients when i last made made enquiries to update research on statins and the efficacy thereof! If anyone knows of this research on the internet I would be glad to hear as the findings there are also now longer accessible either. Of course it could be vaguely due to some administrative error which I duly discount for reasons already alluded! I leave the discerning of you to draw your own conclusions. Multibillion dollar research is carried out at university departments at the behest of big drug companies and where any aspects of their research is inimical to their financial well being of the said drug companies the research is conveniently suppressed. As ex student education officer at TCD , 1969 and ex chair of Birmingham Tribunal unit in the late nineties, I am concerned re the integrity of the funding of research in universities dependent for finance on drug companies. I give talks on diet to interested groups particularly the post 50 age group based on my own family, other experiences and else where and its relationship to nutritional psychology and more specifically the positive and negative effects of diet on endogenous depression. Leslie, are you familiar with Dr. Georgia Ede? See: http://www.diagnosisdiet.com/blog/ She has been studying diet and depression (and other mental maladies) for years. Dr. K, Thank you very much for bringing this video to our attention. I don’t always agree with your columns, but I deeply appreciate your dedication to evidence and truth-finding in medical science. I have read your books and read your emailed columns faithfully. Thanks again for your good work. Oh well, two out of three ain’t bad. I am very curious to know which aspect of Dr Kendrick’s blog you disagree with! Goldman Sachs suggesting that keeping people chronically ill, until they die, is a good business model. Who’d a thunk. One of the key characteristics of that company is that you lose sight of your reflection in the mirror. Probably best that you do. This is not news.It is an honest illustration of medical business ethics, and the importance of the patient. The present medical system offers only drug related treatments for symptoms that create additional symptoms requiring more treatments. Very little to do with making patients healthy. This is the reason that I do not want to become a patient by refusing treatments. Have to look for cures elsewhere. I wonder if Goldman Sachs will go he extra mile and suggest to the medical profession the need to find ‘new’ diseases to not cure ? All in the interests of maximising cash flow of course !! That has already happened. In fact, it has been going on for many years now. Of course there is that non medical disease invented by the statinologists and their friends in the pharmaceutical companies. But of course we here are among the well informed, intelligent, self selected, elite who see through that hoax…So pardon my forgetfulness. Wow, it’s one thing to suspect that this is going on, but it’s an eye opener to actually read about it. I guess I must still be pretty naive… learnin’ fast though. I have to mention, re knowledge, when I was reading Doctoring Data, I kept being blown away by all this new information. It was too much to take in all at once — I would have to put the book down and run and go clean my barn (or whatever active thing needed doing) just to let all that startling info sink in. The part about the heart sometimes building more blood vessels to by-pass blockages (if I understood that correctly… I plan to read the book again) was completely new to me, and I thought “why have I never heard of this before?? ?” and practically threw the book down to go clean madly! Excellent book! I too learned about collateral arteries and asked both cardiologists – mine and the surgeon if that was the reason I did not have a heart attack after my LAD was 95% clogged. They both said yes. Who knew? Why didn’t they mention it without me asking?? Kind of important information if you ask me. I’ve bought several copies of this book, by the way, and given them out. Thanks BobM re Dr.Georgia Ede- most appreciated -and of course to Dr. Malcolm Kendrick whose name I had inadvertently omitted to thank him for this excellent holistic information video which covered a multitude of interrelated objective research. @Goran..Earlier read your comment about splitting & stacking the firewood for next Winter..And how important that exercise is for your health… I know the joys of wood chopping but it can be very ‘asocial’. And we are social, nay tribal animals. Thank you for this video link to my native town of Stockholm. When I was younger I was dancing a lot and I loved it; especially tango with its “habanera step” but I practiced many different types of dancing. For a short while I was also a member of group practicing traditional Swedish folk dancing. Exercise should have been an important item on my “survival” list (my regular exercising during the years built the collaterals which was a strong reason that I survived my severe heart attack according the cardiologist) and I believe here in what Dr. Mercola emphasizes about exercise and healthy arteries when he recommends high intensity in short bursts and repeated a few times. My chopping firewood I think is excellent in this respect and it is not “totally” anti-social since passers by often stop and chat for a while. Goran thanks for the reply ! I do not doubt the health benefits of splitting or chopping wood. For some years I lived on farm and burning the firewood I chainsawed and split was the only way of staying warm in Winter…And I’m glad to read that in your earlier days you danced a lot. in Stockholm..It too helps keep us fit.. It strikes me all the time, and the more I dig into our molecular biology, how incredibly complex our physiological web by epigenetic factors is entangled through psychological factors induced by our social environment on different levels – from international politics to intimate partnerships. My own lifelong partner, since 40 years, is now reading a book about “positive thinking” and is now and then lecturing me about how important this is for our wellbeing and I believe her. Through my window I now look with interest upon the “social” interactions between four mallards in our large pond. It is now a turbulent activity going on during this mating season where one female is courted by the three male birds but she is principally only attached to one of them (typical pair dancing?). Instead it comes from dancing tango.And tonight I found this beautiful video of 2 two dancers dancing in a basketball court hall in Perth ! Just watching them makes me feel so joyful ! I know this isn’t a very popular point to make, but it does seem to me that pharmaceutical companies are being asked to operate in a quite absurd way. They are being asked to do a mountain of research to find a suitable molecule to tackle a disease, and they are then being asked to run extensive trials to test if that molecule is safe. If at some point a problem is found, they are expected to explain what has gone wrong, and drop the potential drug, accepting a $1Bn (say) loss. Clearly if they follow this procedure through for a few potential drugs, there is a fair chance of bankruptcy – so they cheat! Can’t we come up with a more reasonable way of funding this research, so that they get paid for the work they do, rather than only on sales of an end product that may or may not materialise. I think governments should pay these companies to do research on compounds that will then be licensed to the government, or discarded, depending on the outcome, rather than the pharmaceutical company that made the original discovery being left to extract as much profit as possible. Only by making pharmaceutical research into a risk-free activity, where contractors get paid for honest work done, will we get rid of all the criminality that blights the system at present. David, here in Oz there was a time when most medical research was publicly funded & done via government research groups. But it quickly became apparent to private enterprise that this area was an oppportunity to make money. So pressure was mounted on government to privatise them. And that is what happened. An example being CSL ( Commonwealth Serum Laboratories ) which was formerly a publicly owned research body. Now it is listed on the stock markets and shares are worth quite a bit because it is so profitable. A second example is Cochlear which started life as a publicly funded group within Melbourne University. It pioneered implanted hearing devices. And was then privatised as it’s profitability became very apparent to private enterprise.. I suspect that other examples can easily be found around the world. Well at one point society had a love affair with private industry, and never thought through what the competition that drives private enterprise would really mean. I think university research is seen as inefficient (probably correctly), so there may still be value in just changing the way pharmaceutical companies are funded. In a sense this mess is due to the politicians, not the companies that were asked (or maybe permitted) to adopt a crazy model. We see the same problem in many sectors. Contracts are awarded by legal tendering, so you get private exam boards that compete for schools to choose them by making questions easier! Privatising the cleaning of hospitals may seem like a good idea until there are super-bugs thriving in the less hygienic conditions. I mean, there is no analogy with other industries where competition produces amazing results. Think of computer hardware for example. If a chip is shown to contain a flaw, the design can be modified and a new version released very soon. However, a molecule is a molecule. If you change it in any way – say add a methyl group – you end up with something else, that may have totally new problems because so many of these molecules act by binding to the active sites of enzymes or to receptor sites, so the overall shape of the molecule is important – at least that is my understanding. People need to think about the absurdity of what we have right now. Imagine if individual researchers were expected to do their work funded by a personal loan, and only get a pay check if they succeeded (or seemed to have succeeded). Anyone who agreed to work on that basis would probably conclude that they were expected to cheat – just to feed their family! Possibly that is part of the reason pharmaceutical companies are never really punished for what they do. A fine that is less than the money they have made from some bad practice is clearly useless, but if we drove them out of business completely (which they deserve), even the drugs that are useful would be hard to come by. David, I appreciate the thoughts and I’m with you in many respects, but I think pharma is rather keen on the way it’s currently funded. Pharma bleats about the cost of research, but then spends twice as much on publicity for each drug. And they demand legal exceptions from liability for harm from vaccines, whilst telling people such harms rarely if ever occur. Charity shops and charitable events finance a lot of drugs and then we pay again in taxes for stuff that’s often wasted, often harmful and often unnecessary. Yes, if you had a child with leukaemia you’d be more than grateful or really needed an antibiotic but common sense does seem rare. P.S. Raw honey is good on infected wounds it seems. Agree completely Stephen. The very interesting thing is that the Pharmaceutical industry sees as the supplements manufacturers as the major threat & ‘competitor’ for sales and cash flow.. Hence the organised propaganda waves regularly by doctors associated with the pharmacuetical industry to regulate and prevent sales of supplements. TS, not just any honey ! If it has been heated up above about 35 degrees during extraction and bottling, all honey loses this curative property. Also some honeys are far better than others. Honey made by bees from ‘Manuka’ bushes is especially effective.In fact Manuka honey is now so expensive ( $25.00 here for a small jar ) it is sold & used exclusively for it’s medical purposes..
Manuka is a Kiwi/Maori word for Leptospermum scoparium which is actually native to Australia. The plants were introduced to NZ in the 1870’s and they became a bit of an unwanted weed until the medicinal effect of the dark honey was realised. And there are dozens of Leptospermum species in Australia.All of them provide honey which is effective as an antiseptic on burns and wounds. The Australian Leptospermum honey is also cheaper – at least here in Oz. Obviously if Big Pharma were stuffed with well meaning executives, they would be leading the way to design a better way of funding research. However, regardless of their guilt, we are faced with the damage that they do, and society really does need a way forward. Just blaming them isn’t enough – because we actually need some of their products. I am sure many of these companies have excellent research laboratories, and it would be wonderful, if government, charities, or whoever, could pay for research to be done in such a way that the company doing the research could not gain by coming to the wrong conclusions. It isn’t just Big Pharma. I would say that one of the reasons for bad climate science, is that individuals and organisations can see ways to get ahead by promoting alarm where none is needed. Without going off beam (again) on to that topic, isn’t it obvious that if people can gain most by claiming Y when X is true, this will gradually skew the system. Scrupulously honest folk will leave in disgust, people who mistakenly believe Y is true will get promoted, and some of those who recognise that X is true will stay silent because the evidence is too noisy to prove anything beyond argument. New Scientist has always backed statins…and promoted statinology. It is at it again this week with an article by someone named Anthony Warner, which criticises people like you Dr K for opposing statins..
Isn’t nice in a perverse sort of way, that the statinists have decided to fight back ? It means more attention to the true state of affairs. However you must be a paying subscriber to access the full article. Alternatively, I’d suggest people read the article at a news-stand, and then put the magazine back! If it actually names the mavericks, it probably does more harm than good to the cause of statins! I will be doing exactly that David or checking out the copy ay the local public library..But so far that issue has not got here in Oz. It may be Chris.. I am not sure as there is no search function on that web site.So I could not look to see what his opinion of statins is. And the new issue of New Scientist hits our newsagents tomorrow – Monday. I will read the whole article then. There is no way I shall subscribe to it in it’s present incarnation. Looking at the NS website, it’s purely incidental if something is scientific..Incidental to all the various campaigns it is running to force or quicken political & social & economic change. I say, as I have said directly to NS in the past, give me the facts and I make up my own opinion thanks..
Back in the day, I used to read New Scientist in the school library. The Guardian too. Now both are more concerned with memes than science. I seem to remember Malcolm explaining that there is no clear evidence that heterozygous FH does actually confer a serious risk of CVD – partly because FH patients are usually only picked up after they have had an early CVD incident. I if they had to quantify that first paragraph in some way, the risk of having extra cholesterol in the blood would look pretty insignificant! FH should be the real test case for the cholesterol theory, just as Venus should be the real test case for global warming theory! @Malcolm Have I quoted your views correctly above? My lovely 94 year old mother has never had any really serious illness. She now suffers from the effects of old age with poor balance, eyesight and hearing. She loves and has always sought sympathy and support and medicinal drugs help to show everyone how ill she is. 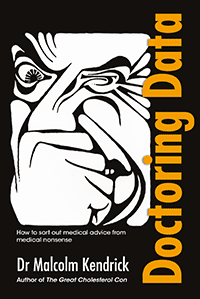 If we don’t go to the GP (or even better, the “specialist”) and come away with some medication to prove we are inflicted, how are people to believe we suffer? Self diagnosis is considered upstart behaviour and you can’t really be hurting anywhere if you haven’t been to the doctor with it. If a doctor stops one of Mum’s (quite unnecessary in my opinion) drugs she gets someone to buy her something to replace it. Recently, to gather more sympathy, my dear mum says she might end it all by stopping taking her medication. Yea, go for it Mum, you’ll feel a new woman! But I know how much she “needs” them. She’ll never give them up. I wonder if anyone has written about the psychology of medicinal drug taking. Hardly be a best seller! TS. Now would your elderly mother be better off on placebo pills – labelled appropriately of course ? The sad thing is that we had just stuck to the sort of diet I used to eat in the sixties when I was growing up, where fat was not considered a villain, and generally revered for its taste, and its satiating effect, we would naturally have eaten less carbohydrate (which I admit I also like) and we probably wouldn’t have the problem we’ve got now. Since reading The Great Cholesterol Con, I have simply eaten what I fancied, with no avoidance of fats, but not eschewing carbohydrates either. I’ve lost a bit of weight, and it’s easy to keep off. Another factor in the CVD equation. I know, I saw this study a few years back. A study which proves that women are bad for health ;). Of course, more likely a study which proves that a highly stressful life is bad for health. Unfortunately my practice here in Oz has just lost its dietitian who believed in LCHF, and the new one is of the LFHC variety for diabetes. No referrals there then. Watched the whole video, and found little that any reader of this blog didn’t already know. If the Queen’s ex-physician doesn’t believe that supplements may be necessary, he obviously hasn’t yet read the recent research suggesting that sub-clinical magnesium deficiency is probably the most common cause of heart attacks. Here in Oz, the Department of Agriculture website states that the Australian soil is lacking in lots of nutrients and how to replace them. You need volcanoes and/or glaciers to replace them and we ain’t had any of them for a good few million years. Managing to get more of my patients to appreciate the logic of LCHF for diabetes. John, I assume you had no real say in the selection process for the new dietition ? Dietitians must have a split mind; what they were taught in school and what they learn form their practice if they care. Goran I have not had a consultation with a dietitian my whole life & I have no intention of doing so. I had some comment interactions with a fairly prominent elderly HCLF one here via a blog. Her mind was so closed it was not worth continuing the conversation. Goran, do most dietitians ever learn anything after their training? My daughter and her colleagues recently had a talk from an NHS dietitian who said a low-fat yoghurt with some sugar was better than the full fat version. Carbs by the bucket are still good and fat is bad. The good news is that several women in the audience queried this and a debate followed. No one seems to have any respect for the so called profession of ‘dietitian’. Has any group ever had less credibility? Thank you for the transcript of this interview with Malcolm – here I find an intriguing CVD-logic. And it strongly reminds me of what I learnt from a Swede, Prof. emeritus Karl Arfors, who did some profound research on the endothelial glycocalyx layers and through an ingenious electron microscopy method he developed with his research team. These layers he found to be very sensitive to disturbances of different kinds. The interesting here is that he turned into a very strong advocate for NO supplements through dietary means, preferably red beet juice. Red beet juice should perhaps be included on my “short list” for CVD-survival. Hi Goran, re beet juice and leafy greens and the importance of plant based molecules. Beginning this summer Canada is allowing individuals to cultivate 4 cannabis plants. This sparked my interest in the medicinal properties of plants and subsequently ordered 5 cannabis seeds. Canada should see a big drop in CVD due to stress reduction. Malcolm I have been reading the transcript of this interview. I’m up to page 6 at the moment and there are 47 pages in total. Already I am reading interesting info that I have not seen before in this blog, or even in your books. A very interesting interview ! Thanks Mad Max for posting the link ! I’ve been compiling the list of links to your “what-causes-heart-disease” posts in original order for the benefit of a friend. Today, I noticed that the link to Dr Yusuf’s video in part XXV1 seems to be broken. ), “This video is unavailable” if I try to play it. In the blog (https://drmalcolmkendrick.org/page/2/), the video link goes to the Aseem Malhotra talk! This may be a bit off topic, I became interested because a friend of mine was put on ciprofloxacin around 2005. Since then I have kept an eye of what`s going on. I was surprised how many people in the U.S. feel that they have been hurt by this group of antibiotics. They call themselves “floxies”. 2015 – FDA invited a selected group of “floxies” to tell their stories (in a few minutes). 2018 – I saw an article on Läkemedelsverket`s website about the hearing in London. This has not received any attention in the media here in Sweden and I doubt that it has in any other European country. I have found lot of interesting stories on the following sites: http://www.fqresearch.org, http://www.floxiehope.com, http://www.fqvictims.org, http://www.saferpills.org, http://www.ciproispoison.com and http://www.quintoxsupport.co.uk/. I also read Stephen Frieds interesting book – “Bitter Pills: Inside the hazardous world of Legal Drugs”. Dr. Jay S. Cohen has also written about fluoroquinolones. Unfortunately, I have not read this book: from 2015 – “How We Can Halt The Cipro & Levaquin Catastrophe: The Worst Medication Disaster In U.S. History” . The Hearing will be video filmed but it would be nice if as many people as possible attended. You have to register. The recognition of delayed adverse reactions and tolerance thresholds for mitochondrial damaging drugs and vaccines will go far in helping both doctors and patients to recognize mitochondrial damage related adverse drug reactions (and adverse vaccine reactions). Once the reactions are recognized, perhaps some pressure can be put on the FDA and/or the pharmaceutical companies to test how drugs affect mitochondria before they are released onto the market. After all, mitochondrial damage and oxidative stress are causally related to almost every chronic illness. It would be nice if doctors, those in the pharmaceutical industry, the FDA regulators, and others, recognized the harm that drugs do to mitochondria, and the symptoms of iatrogenic mitochondrial dysfunction”. David Bailey re mitochondria and cancer, makes sense. Every cell depends on energy provided by the mitochondria. There are endocannabinoid receptors on the mitochondria. Endocannabinoid dysregulation might be something to look into. Would supplying exogenous phytocannabinoids be helpful in reversing cancer, ALS and a few other things? As an amateur scientist I will conduct an experiment to see if consuming cannabis can reduce glaucoma. Most interesting! Yes, cancer, cancer, cancer – I think it is all but proven now that it is a disease of the mitochondria. Check out Tripping Over The Truth by Travis Chrisofferson. It is based upon the work (mainly) of a guy named Seyfried and rehabilitates Otto Warburg. The book is a most excellent read, hard to put down and so useful. AnnaM, I have come to the realization that there are only two basic things to worry about, condition of the mitochondria and the gut microbiome. Also an ageing body needs more maintenance to maintain homeostasis. Since this thread is about “alternative” medicine and how it is suppressed by “mainstream” medicine, I think the following entry on the “vitamin website” of Linus Pauling is here appropriate. Thanks for the link Goran. Randal, let us all hope that all people on statins recognise the incapacitating side effects and stop taking the crap.. The point I keep pressing on people is, if you feel the side effects it is probably very unwise to try to persevere with statins. A lot of people report permanent statin damage, and I can’t help feeling that that may be the result of continuing to take the stuff, even when it is clear that it is causing problems. Some people think statins are so good, they stagger about in pain while still washing their statins down each night! In my experience the pain is definitely peculiar – not like arthritis – so it is fairly easy to recognise. In my brush with statins, each time the problem started, I stopped taking the drug for a while until I felt better (but this was a safety precaution, I hadn’t realised that the statin was the culprit). I dread to think what would have happened if I had just pushed on to ‘save’ my life, but there was absolutely no clear medical advice to guide me. There’s often confusion about what to believe in medical matters, and it isn’t helped by attention-grabbing headlines contradicting what that publication had run with weeks earlier. It might sell newspapers but science-and evidence-based ideas are discredited and people end up by saying they don’t know what to believe. Our only choice is to keep on keeping on. A united front doesn’t mean we all have to believe the same thing. But within narrow limits all those broadly in the Kendrick-Malhotra-Harcombe-Noakes-Teicholz-(and all the other good guys) camp do agree on most things and the collapse of the old paradigms gets closer all the time. The claim is made that certain supplements can reverse aging of the arteries.. I happen to agree with this line of thinking. But the article itself is frustrating as it lacks detail…And no source link is provided..
Just to let you know that “the angry chef” is telling us all in New Scientist to take our statins or we will all die of heart attacks! If this was some cardiologist, I might still have paid some attention, but a chef who claims to love science etc.- hello! He is just angry (uses the f-word a lot) and ignorant (which is why he gets angry many a time). Those interested can get his ideas (many of which are OK) on his blog. What worries me is that he has now moved out of his area of expertise completely. Why New Scientist would allow him to be a shill for big pharma is troubling. I have written to him, inviting a debate on the matter. I have not read the article. We shall see if he responds. Thank you for the link – Interesting! I didn’t know about this “angry chef”. I though have a problem with this kind of affirmative people who for certain know that they are the ones who know. There is a lack of scientific humbleness in my eyes. Gary Taubes, where I see this attitude, seems to be their favorite target but I wonder if they really have read his “Good Calories & Bad Calories” which to me is a very solid piece of scientific journalism, though considered ‘difficult to read’. My experience from having debated with a a few of this type during my 10 years on very low carb eating is that it is almost impossible to keep a scientific sensible atmosphere in a debate. What one meets is often very categorical attitudes and verbal abuses which are really not constructive but rather turns into “fence building” and rock throwing across it. Why would New Scientist allow him to be a shill for big Pharma & statins ? That is a good question and speaks to the decline of New Scientist over the course of the last decade. It used to be people working in the sciences and engineering and those who wanted to be informed about such the facts & discoveries in such issues. Now it’s role is to tell us what to think as dictated by it’s ideology. Using an abusive author of a cooking blog fits that purpose, so it is done. While making the comment above, I remembered that I had not read the whole of Warner’s article in NS. So this morning I went to the local library and read through it.. I am still unimpressed. He is indeed a chef. He is not an expert in statins & CVD. Nor does he demonstrate in this article any particular knowledge or personal experience in the issue. And he does not cite any science sources or even ‘experts’ to support his comments. That is a major flaw. So Dr Kendrick, it seems that the long campaign to inform the public of the dangers of statins, is working…. This “chef” you quote mentions self-styled researchers. Isn’t that precisely what he is? I venture to state that the self-styled researchers on this comments list are at least as rigorous as he is! And I know who I would rather trust! Reply already left, but it appears to have evaporated, so sorry if this is a repeat. You say that the chap refers to “self-styled researchers” Sure we are, but isn’t that what he is? I know which parties I would rather trust. .Anyway, it is about being open minded. And a bit cynical. Looked at his blog. Is this creature for real? Angry? Goes without saying. I am always wary of loud mouth blaggards with the need to express themselves with the F word every 10 seconds! However, should he be short on Statins, he can have my prescription (80Mgs Atorvastatin yummy yummy!) they took all of 7 weeks to put me in hospital with liver damage, over two years ago. Never touched them since. Joyce. When I removed the statins against medical advice, (5 years ago),I was asked to have repeat liver function tests done. and I agreed. I have never been back for blood tests since, as the health care assistant explained with such confidence that it was my alcohol intake which had caused the problem! I rarely drank until 5 years ago, but I enjoy wine and spirits in moderation now, so goodness knows what my LFTs look like now. No doubt she probably could interpret them better than our elusive GPs. But…here I am .still plodding on nicely 5 years down the line, thanks to being medication-free. Ho, Hum….that is the way our NHS is heading…the uneducated, as well as some educated, professing to have the low down on everything. You might be able to try an interesting experiment with your statins! I seem to remember reading somewhere that statins are actually pretty poisonous to animal and plant life, and that if you water a (non-favourite) potted plant with statins, it will rapidly die! I’d already thrown mine away before I read this! A WORRYING snapshot of flagging statin use has emerged. These controversial cholesterol-busting drugs are not being taken in many cases in which they could cut the risk of cardiovascular disease, the world’s biggest killer. Recent figures for England and the US show that many people who could benefit from the medicines are not getting them. At the same time, a highly vocal group, which includes a number of campaigning medics and self-styled researchers, are decrying the wider use of these drugs. Some of these critics have alternative diets and supplements to promote. They argue that statins are over prescribed, and that their side effects can outweigh the benefits. Although one in three people globally die from cardiovascular disease, in many nations efforts to cut the toll have helped. This is mainly thanks to increased knowledge of risk factors, especially smoking, high blood pressure and high blood cholesterol. Key among the innovations are statins, which have saved many lives since their introduction in 1987. These drugs partially inhibit enzymes that make cholesterol in the body, reducing levels of low-density lipoprotein (LDL, the so-called bad cholesterol). Which brings us to another anti-statin point of view. Some of the critics suggest that LDL cholesterol is not the villain it has been made out to be, and that its relationship to cardiovascular disease is overstated; this goes against a lot of evidence. The simplistic notion that herbal supplements, vitamin pills or diets – for example, low-carb/high-fat plans – are a better bet than medical intervention carries with it the risk that people will develop a false sense of security. They may imagine that just because they visit a health food shop or follow a fad diet they are safe. The most persuasive point made by this outspoken group is that statins encourage people to pop pills rather than change lifestyle. Although in many ways this is laudable, it is a false dichotomy. In short, those who say statins risk over-medicalising society seem to ignore the danger of under-medicalising those at risk. You should not abandon drugs just because lifestyle factors are important too. Preventative treatments can attract heightened suspicion and fear, as shown by the spread of nonsense related to vaccines. While most people reject the views of the anti-vaccination crowd, anti-statin ones seem to receive less mainstream criticism. For anyone who loves science and rationality, vaccine denial is the benchmark of stupidity, and worth fighting against. In time, I believe that we shall view the fight over statins in a similar way. Totarum and Dr Kendrick I see you have finally allowed my critical comment about New Scientist up above. In other words New Scientist has NEVER published any article or news that reports on the side effects of statins. Bugger ! Total censorship in a supposedly science based, English language weekly magazine ! And they want us to pay big money to subscribe to it ? Bahhh ! Now a suggestion : I wonder if New Scientist would invite you Dr Kendrick, to write a reply to Warner’s comment ? As a doctor with years of experience and study of this issue. I’m sure you are well qualified. Just did a search on NS just for “statins”. And got lots of hits including lots of articles discussing side effects.. So the ‘no search results’ I got earlier was an artifact of the NS’s own search engine’s processes. And if that is the quality of their search engine, it is not very reassuring. I think it unlikely. The New Scientist is very much the voice of the scientific establishment. This review provides an outline of the association between major depressive disorder (MDD) and coronary heart disease (CHD). Much is known about the two individual clinical conditions; however, it is not until recently, biological mechanisms have been uncovered that link both MDD and CHD. The activation of stress pathways have been implicated as a neurochemical mechanism that links MDD and CHD. Depression is known to be associated with poorer outcomes of CHD. Psychological factors, such as major depression and stress, are now known as risk factors for developing CHD, which is as important and is independent of classic risk factors, such as hypertension, diabetes mellitus, and cigarette smoking. Both conditions have great socioeconomic importance given that depression and CHD are likely to be two of the three leading causes of global burden of disease. Better understanding of the common causal pathways will help us delineate more appropriate treatments. The common causal pathways have all been worked out. Only slight problem. They have nothing to do with LDL/cholesterol, so the ‘experts’ in CVD have no interest in them. No money to be made, sadly. “Angry chef” possible undisclosed conflict of interest: he might be receiving a lifetime supply of maximum dose statins from the sponsors. Angry Chef: He has either been “paid” (in various not so direct ways) or is a fool. We should never replace sugar with artificial sweeteners, the body reacts to these as if they were sugar, so you have the same effects as eating sugar. Learn to reduce your sugar so you eat less and less until you start to dislike sweetness.